A few comments and thoughts about crime books set on the mainland of Europe, with titbits about real eurocrime. We hear so much about crime in the USA that many people imagine that Europe is a crime free zone. In crime fiction Europe has become a real challenger to the Americans, but unfortunately real life crime especially in Britain is increasing as well. That alone should have encouraged me, but when I won a copy of number five 'Curse of the Pogo Stick', and my son travelled off to Cambodia right next door Laos, where the stories are set, I had to buy the first three books to complete the series, and start reading. [since then another book, The Merry Misogynist, has been published in hardback]. Laos, 1976: the Pathet Lao after fighting in the jungle for many years have deposed the royal family and taken power. The 72 year old Dr Siri Paiboun was looking forward to a well earned retirement, but the great honour of becoming National Coroner to the People's Republic of Laos is bestowed on him. Siri was always a reluctant communist who in Paris many years before had only joined the party because the love of his life, the beautiful Bouasawan, was dedicated to the revolutionary movement. Comrade Siri has a brilliant intuitive and inquisitive mind that will allow him to excel in the position of coroner. He also has other powers and abilities that seem perfectly natural in the world Colin Cotterill describes with such loving care. But his sense of humour, lack of respect for his nominal superiors, and subtle appreciation of the ridiculous make him totally unsuitable for working in an unsympathetic communist regime. Although he has no training as a pathologist, and only one ancient textbook, he is lucky that to assist him in the morgue he has a happy dedicated twosome, his nurse Dtui, who reads out of date fashion magazines, and Mr Geung, the morgue labourer, who has Down's Syndrome. More about Mr Geung in another post. Laos is a poor landlocked country and Dr Siri has to suffer a shortage of chemical tests, forensic technology and all the other assistance that Western pathologists take for granted. When Mrs Nitnoy the wife of local party big wig Comrade Kham dies in suspicious circumstances Siri has to tread carefully as he deals with his young incompetent boss, Judge Haeng, and the party hierarchy. When the bodies of two apparently tortured Vietnamese soldiers bob to the surface of a Laotian lake, an international crisis is imminent, and Siri's life is at risk. He has to seek help from his lunch partner, old comrade Civilai, a policeman Inspector Phosy, and a Vietnamese doctor, Nguyen Hong; while of course he is assisted by the spirits of the dead that come to him in his dreams. 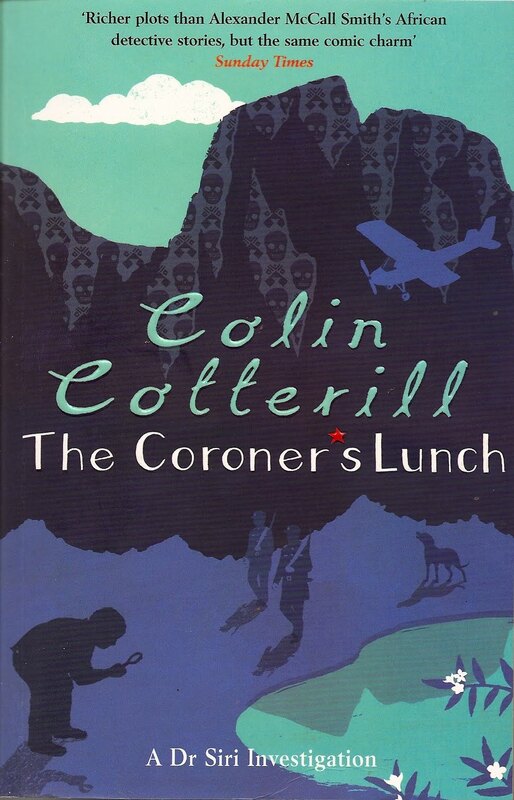 Colin Cotterill, who won the 2009 Crime Writer's Association "Dagger in the Library' prize, has mastered the technique of imparting chunks of information, about a country we know very little about, while keeping us engrossed with a clever plot. We learn about the Hmong people and their shamanic belief in tree spirits, and about the antagonisms between the richer and more powerful countries in the region, Taiwan, China and Vietnam. But as with most of my favourite crime fiction it is the clever humour, and the sharply drawn characters that bring the greatest pleasure. I am really looking forward to reading the rest of the series, and getting further acquainted with these superbly quirky characters. Civilai rolled his eyes. He was obviously slated to meet the Cuban delegation too. Here you can read Maxine of Petrona's excellent and enthusiastic review of The Coroner's Lunch at Euro Crime. Lovely review, Norman. These books, as well as having many other great aspects, epitomise why Fascists, Communists, Nazis and other dictatorships can never prevail, while there are gentle subverters like Siri and his band of humble but unmanageable friends. These books are a lovely mixture of humour and the hard-hitting - a slap in the face to evil regimes everywhere, at all levels. Thanks very much Maxine. I agree one the best aspects of crime fiction is that it allows authors to discuss these evil regimes. I worry that another generation is being brain washed to believe totalitarianism is a better form of government than democracy by educators and a media who are committed to balancing both sides in an argument rather than accepting the truth. I have a few thoughts about the wonderful Mr Geung and will post them next week. After a few more books and then it will be back to Dr Siri and Thirty Three Teeth. Like you Norman I only discovered this series this year (probably via someone else in the FF room - I can't remember who now) and was quite annoyed with myself that I hadn't found these books earlier as they seem to offer everything I love most in a book. I look forward to the next one but I don't like reading series books in quick succession though so I'll wait a little while longer before re-visiting Dr Siri and friends. I agree Bernadette series books lose something of their freshness if you read them without a break so I will return to Dr Siri in the New Year. Uriah Robinson is the blogname of a short, balding, retired health care professional.